Stock market, currency data @ March 29, 2018. Expectations of a boom in demand for battery raw materials as automakers move away from internal combustion engines kept cobalt and nickel prices on the boil during the first quarter. Cobalt is up another 24% in 2018 as it builds on a more than fourfold increase in value from record lows early 2016. Nickel, together with manganese and cobalt the crucial elements in batteries favoured by most of the world’s vehicle manufacturers, gained 8.6% during the first three months of the year. 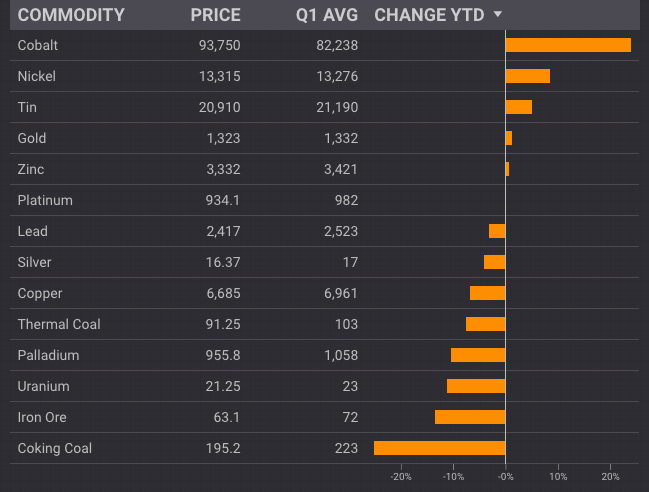 With the exception of tin (the metal is catching up after a fall in price last year) all metals are now trading below their average price during Q1 as the rally in last year's top performers like zinc and lead stall on concerns of rising supply and inventories, and the impact of a possible full-blown global trade war. Most worrisome for mining investors is copper which recently fell through the $3.00 a pound mark and has given up 6.6% in value this year. Copper, widely used in manufacturing, transportation, and the construction and power sector, is seen as a barometer of global economic conditions. Precious metals markets have also been sapped of energy with gold and platinum ending the period at breakeven while high-flying palladium is down double digits in percentage terms following a 56% gain in 2017. Despite record trading volumes – 9.8 billion ounces of gold where traded on options and futures markets in 2017 – the gold price has seen little movement. According to the CPM 2018 Gold Yearbook volatility on gold markets fell to the lowest since 1996 last year. While met coal is continuing its decline dropping to below $200 a tonne from $260 at the start of the year, thermal coal has been more resilient – seaborne prices still averaged in triple digits during the first quarter compared to $85 over the course of last year. Despite record-setting stockpiles in top consumer China above 160m tonnes, iron ore has defied expectations of a sharper decline and during Q1 the steelmaking raw material almost exactly matched 2017’s average price of $71.80 a tonne. 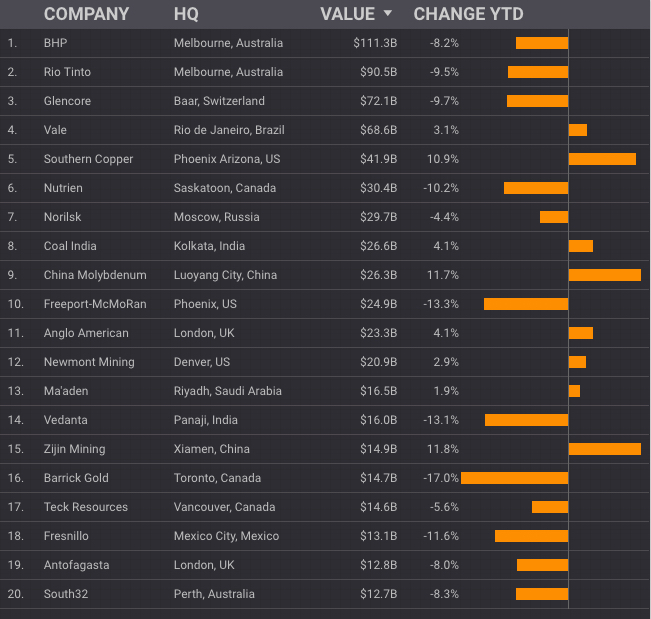 The share price performance of the world’s 20 largest companies during the quarter also indicative of softer conditions in the sector with the majority suffering declining market values this year. The top three diversified miners – BHP, Rio and Glencore – lost a combined $27 billion in market cap in Q1 despite the latter cashing in on a revitalized cobalt and nickel market. Nutrien, the combination of Potashcorp and Agrium to form the world’s largest potash producer, is down more than 10% this year reflecting the depressed market for the crop nutrient. Potash prices are hovering just above levels not seen since 2007 and with top importer India cutting its import subsidies 10% last week there is little in the offing to improve sentiment.